gastronomy [ga-stron-uh-mee] noun | the art or science of good eating, a style of cooking or eating. sovereign [sov-er-in] noun | a group or body of persons having sovereign authority. supreme, independent, indisputable. it's a mouthful. in more ways than one! 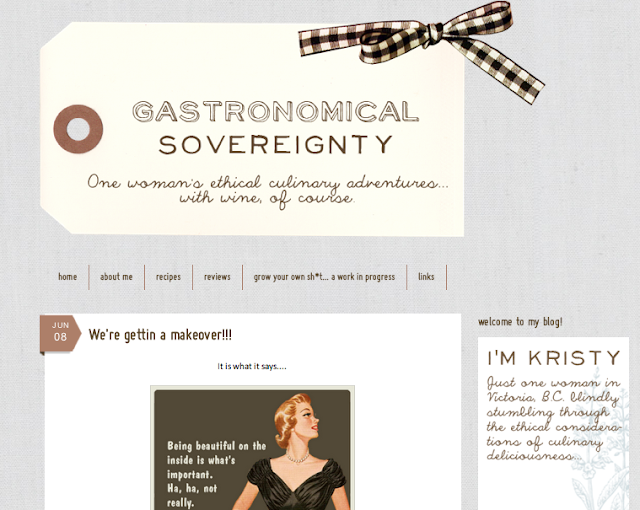 i would like to introduce you to a good friend of mine, kristy from gastronomical sovereignty. over a year ago, when kristy and i were working together at a restaurant, we spoke about food. * i said "you know a lot about this, you should start a blog." so she did (after some modest procrastinating that is...). kristy has some intimidating but very important ideas about food. intimidating because they involve subjects which many of us might like to ignore. important, because her opinions are years ahead of the rest of us. it's kind of like how in the eighties, certain people started to think about the repercussions of how we treat the earth. and now it's commonplace - we hear about ways to recycle, reuse and "be green" every single day. ** so in a couple years, kristy can look at all of us and say "i told you so." but she won't do that. she'll just keep fighting for change now. that's not the coolest thing about kristy though. the best part about gastronomical sovereignty is that she loves food, loves to cook, and loves to share this passion with her readers (with wine of course!). she happily tests recipes (her own, and others) and then shares with readers the results, recipes and photographs. do me a favour and check out her blog. maybe follow it for a bit and see if it inspires you. and then in a decade or so, you to can say "i told you so! p.s. i'm a wicked cook." p.p.s. she's having a giveaway! some of her recipes on beautiful cards! * i know you're thinking - however did that topic arise? ** and if you live in victoria like we do, you hear it twenty times a day. PS. honoured to be featured in your post. Xo. you're blog is SOOOOOO cute! I will have to share this idea of gastronomical sovereignty with my roommate she will agree. Thank you for recommending this blog!! I LOVE food blogs, I'm going to start a bakery very soon!! And I love your blog! And thank you for the comment on mine, you made me feel less alone with all this wedding stuff! Please stop by on Wednesdays for the Wedding Wednesdays, I'd love all the advice I can get, and I loved your advice on the guest post! !